There’s a good chance that you’ve had experiences with gliding (also known as sliding) windows that have not lived up to their name. Older or poorly manufactured gliding window will catch or lift off their track, making opening and closing them a difficult task. This difficulty in opening and closing leads to many hassles, among them elevated energy bills and constant maintenance. 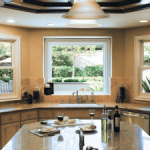 These are all hassles you won’t have to deal with when you choose top quality gliding windows from Renewal® by Andersen of Greater Philadelphia. Renewal® gliding windows boasts a sleek, space saving design that makes them perfect for window spaces that overlook walkways, patios, or decks. The smooth, easy to maintain tracks keep the windows from slipping or catching, making Renewal® gliding windows respond to the touch of a finger. Plus, of any of our operable windows, our gliding windows offer the largest glass surface area, which will give you a wide-angle view of the beautiful Pennsylvania outdoors. For homeowners in Philadelphia, Havertown, Ardmore, and Chester, gliding windows offer a wide range of benefits. The Fibrex® material and Low-E glass used to produce them offer excellent energy efficiency. The tracks that hold the windows so firmly in place can also release the panels for easy maintenance. And Renewal® offers a wide range of interior and exterior colors and finishes that will make your new gliding windows the eye catching talk of the neighborhood. As with all of the products we install, our gliding windows are backed by industry-leading warranties. To learn more about gliding windows, we encourage you to call Renewal® by Andersen of Greater Philadelphia today at 610-563-2190. We will help you to schedule a free no obligation window consultation with our factory trained window experts.